One of the top off-season story lines wasn’t actually a story at all – it was the non-trade of Cole Hamels. Despite constant speculation and rumors throughout the winter, Hamels was not traded and remains a member of the Philadelphia Phillies. 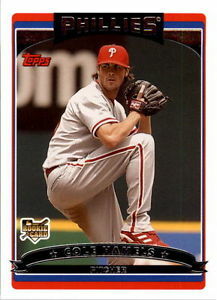 Considering the low expectations for the 2015 Phillies, most expected that they would move Hamels to a contending team in order to acquire some young talent. That has not yet happened, but there is a long way to go in 2015. There have been plenty of surprised in the early 2015 season, but the Phillies have not been one of them. They are 4-9 after 13 games of the 2015 season, and have been outscored by 24 runs already. The expectation that they would be one of the worst teams in the National League appears well on its way to becoming reality. That means that by the trading deadline at the end of July, the Phillies should be safely in the ‘sellers’ camp. The big gamble that the Phillies are taking is that Hamels will maintain his value throughout the season until the trade deadline rolls around. So far, that hasn’t necessarily been the case. After three starts, Hamels is carrying an ERA of 5.00 and has already walked nine batters. His total of 18 strikeouts is impressive, but the seven home runs that he has surrendered could be a potential warning sign to any possible trade partners. Certainly three starts won’t undo all of the good that Hamels has done in his career, but the Phillies are hoping for the maximum return trade value from their top asset – and his start to the season has not helped toward that end. One of the likely trade targets for Cole Hamels is Boston, as they have assembled a team that appears to have a strong lineup with a questionable starting rotation. However, the Red Sox have started 8-5 on the young season, and the rotation hasn’t been quite as bad as some were predicting. If the Red Sox don’t need to send young talent to Philly for Hamels, the market for their ace will suddenly get smaller. While there is always a need for quality pitchers, the package that Philadelphia is able to receive in return will be directly related to the size and competitiveness of the market as July draws to a close. The St. Louis Cardinals have a well-earned reputation as one of the best-run franchises in all of baseball. One look at their recent resume would suggest that they do, in fact, know what they are doing. A constant presence in the playoffs, the Cardinals seem well-positioned to remain as a force in the National League for many years to come. The Los Angeles Angels of Anaheim, on the other hand, seem to be trending in the opposite direction. After a very successful first decade of the new century, the Angels have started throwing money at their problems – only to end up with more problems. The last two off seasons have seen the Angels making the biggest splash, first with Albert Pujols, and next with Josh Hamilton. Neither of those moves have paid off to this point, and the Angels appear to be going nowhere fast. Given the fact that the Angels have a glut of outfielders and no third baseman to speak of, the Cardinals made sense as trade partners. The Cardinals have plenty of infielders to go around, but were a little thin in the outfield department – especially center. 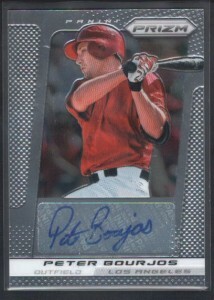 Peter Bourjos is one of the fastest players in baseball and a great defensive outfielder. In addition, he hits better, and for more power, than your average speedy outfielder. When he can stay healthy, Bourjos is an enviable player that forces the opponent into a lot of uncomfortable positions. While it is easy to see why the Cardinals would be interested in Bourjos, it is not so obvious why the Angels would be willing to deal him for David Freese. 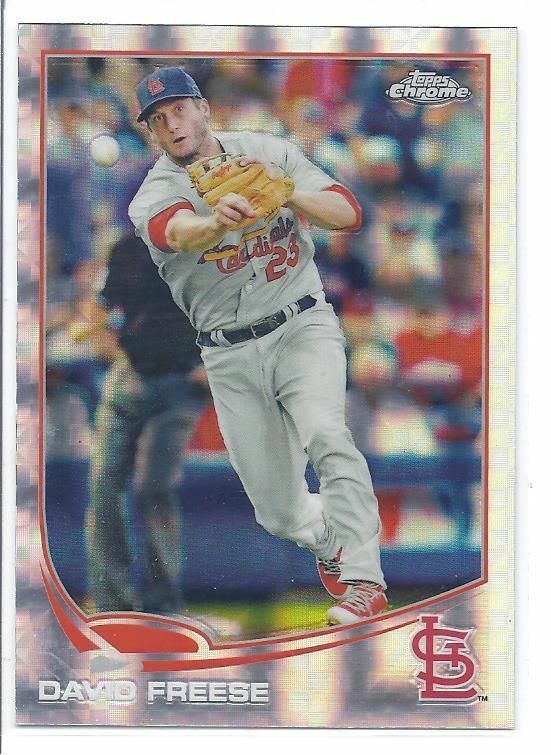 Although Freese will live in St. Louis history forever after his amazing 2011 World Series performance, his 2013 campaign left a lot to be desired. He posted career lows in just about every category, and flopped in a big way in October. 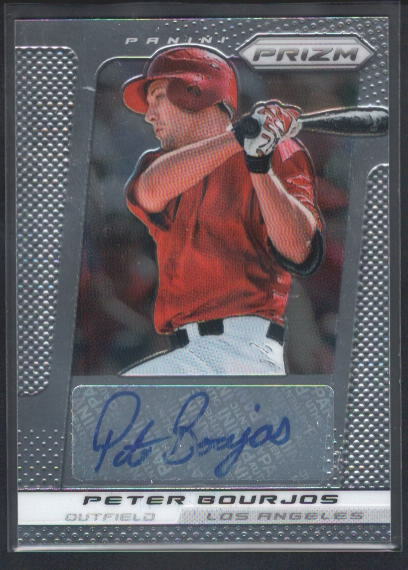 He is only under contract for two more years, as opposed to three for Bourjos, and will be more expensive to boot. Sure, the Angels needed a third baseman, but way Freese? And why give up Bourjos? As it stands, this trade seems like an easy win for the Cardinals. They addressed a significant need without having to part with anything of too much value or pay high free agent prices. The only obviously trouble that could be lurking on St. Louis end is the injury trouble that seems to follow Bourjos. If he can stay on the field, he’s an asset – but that’s a big if. For Anaheim, the deal seems less than desirable. Sure, Freese could rebound and be a useful player for the next couple years, but there is a chance that his useful days are behind him. Typically, hitters numbers get worse when moving from the National to American league, and Freese certainly can’t afford to go down much from where he was in 2013. It will all play out in time, but St. Louis fans sure have to feel better about this deal as it looks today. Miguel Cabrera – Twice the King? It had been 45 years since Carl Yastrzemski and the last Triple Crown to be achieved in baseball when Miguel Cabrera reached the feat for the Detroit Tigers in 2012. Incredibly, he is having an even better season in 2013 and just might reach that staggering mark for the second consecutive year. If he can hit a few more home runs, and get Chris ‘Crush’ Davis to slow down a bit, Cabrera could find himself in even more rarefied air. With all of the accomplishments that Cabrera has had in Detroit, it is easy to forget that his career started with the then-Florida Marlins a decade ago. While he has always been an impressive hitter, his career didn’t hit another gear until he landed in Motor City. In the last four seasons, he has only had one with an OPS of under 1.000, and that was in the Triple Crown year of 2012 when he posted a .999! What makes Cabrera such a standout at the plate? Well, just about everything. He hits for power to all fields, walks almost as much as he strikes out, and seems to come through in the clutch time after time. It surely doesn’t hurt that he has an excellent supporting cast around him in the Tigers lineup, but Cabrera could hit like a Hall of Famer on an island by himself. Considering that he is only 30 years of age currently, the numbers that he could theoretically end up with might place him as the best right handed hitter of all time. Those are big words, but that is just how good Mr. Cabrera has become in recent years. 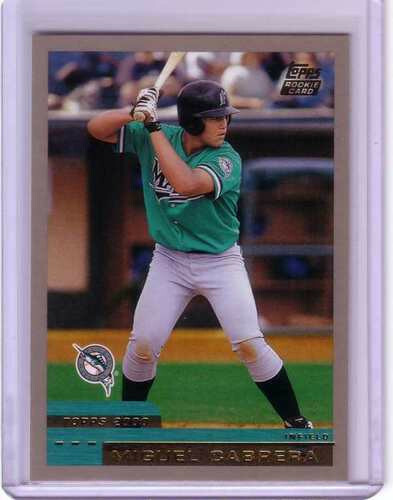 In terms of collectibles, it stands to reason that his early days Florida Marlins memorabilia will be the most desired products on the market. In the last few years, Cabrera has been a superstar and his likeness has been everywhere. However, he flew somewhat under the radar with the Marlins even though they won the World Series in his rookie year. Those early cards, autographs, and more could find themselves to be worth a great deal as his career continues to he eventually ends up in Cooperstown. Where will Miguel Cabrera head from here? There is no way to know, but nothing seems impossible for this guy. Could he hit .400 in a full season? That would seem absurd for a man with his kind of raw power, but then again he is hitting a career best .360 at the moment with no signs of slowing down. I wouldn’t bet on a .400 season from Cabrera – but then again, I wouldn’t have bet on back to back Triple Crowns, and that just might happen. For Miguel Cabrera fans and collectors, finding early years pieces will be the best way to build value in a collection and round out the whole picture of his career. He spent almost five full seasons in Florida before moving on to Detroit, yet his time with the Tigers is what will make him a legend. Make sure to find a good selection of Florida Marlins collectibles to go with your Tigers collection and you will have a Cabrera collection worth bragging about. First enacted in 1973, the designated hitter has come to play a prominent role within the sport of baseball over the past few decades. Because the position is only available in the American League, it gives baseball memorabilia collectors not only another area of interest to focus on, but another way to enjoy collecting in general as well. Arguments have been raging back and forth as to whether there should even be a designated hitter or if it should be implemented in both leagues, but regardless it is likely here to stay for a significant amount of time. What follows are some of the most accomplished designated hitters to have played the game to this point. One of the more prevalent power hitters of the modern era, Thome will likely go down as one of the best designated hitters of all time as well. Having played over 20 years in Major League Baseball, Jim racked up over 600 home runs, 1,600 RBIs and well over 2,000 hits to go with a .276 average as well. 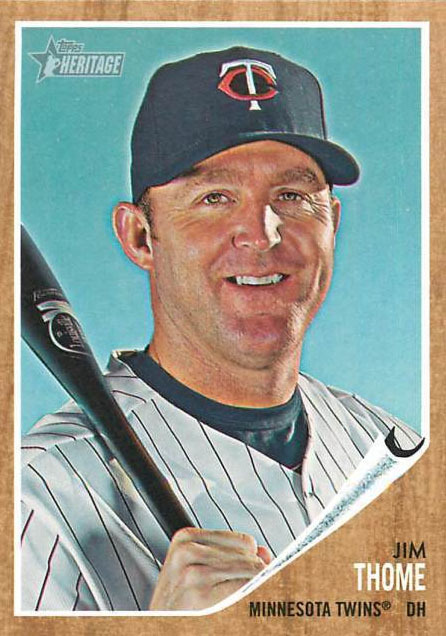 He was selected to five All Star games over the course of his career and should easily make it into the Hall of Fame on the first ballot, making Thome appealing to baseball memorabilia collectors. Frank Thomas was one of the giants of the game during the modern era as well, but what separates him from someone like Thome was his ability to hit for average as well as power. Frank hit over 520 home runs for his career to go with a sparkling .301 average along with over 2,400 hits as well. 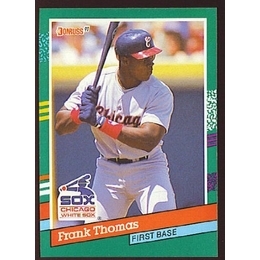 Thomas was in his prime for the Chicago White Sox during the early 1990’s when he won the AL MVP award in 1993 and 1994, and his memorabilia is still highly collectible today. 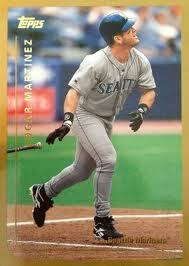 Martinez was most known for his role as a designated hitter for the Seattle Mariners during his nearly 20 year career. Edgar hit over .310 for his career with nearly 2,300 hits and over 300 home runs as well, and went to the All Star game on seven occasions. One of the most defining aspects of his time in Major League Baseball is that the best designated hitter award for each year is named in his honor with the Edgar Martinez Award. Unfortunately Martinez has not been elected into the Hall of Fame yet, but that should not take away from his memorabilia value. Unlike many designated hitters these days who mostly hit for power with a little bit of average as well, Paul Molitor mostly hit for average and had tremendous speed on the basepaths. 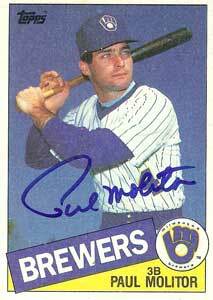 Molitor had a .306 average for his career along with over 3,000 hits and 500 stolen bases. He was selected to seven All Star games and won the Silver Slugger award on four different occasions as well. Paul was elected in to the Hall of Fame in 2004 with over 85% of the vote and remains popular among memorabilia aficionados. Take a look at this outstanding 1931 first generation wire photograph of Babe Ruth. 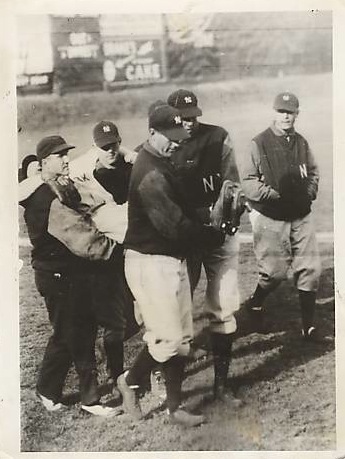 This photo shows Babe Ruth being carried off the field with an injury during the opening game of the 1931 season against the Boston Red Sox. The wire service is NEA Service, Inc. New York and the photograph is dated May 2, 1931. The back of the photo says the following: “CARRING THE INJURED BABE FROM THE FIELD an injury to the left leg of Babe Ruth, reported a torn ligament, marred the official opening of the American League season in Boston, Mass. A series of mishaps, climaxed by his collapse in the sixth inning as he was chasing a two base hit from the bat of Oliver, Boston Red Sox outfielder, put the Yankee Slugger out of the game, and into the hospital. Despite the loss of the Bam, who may be out for a week or two, the Yanks won from the Sox. This picture telephotoed from Boston, shows the Babe being carried into the dressing room. This wire photo is offered by SportscardsNart on eBay with a buy it now price of $4,995. Check out some more vintage photos of Babe Ruth.